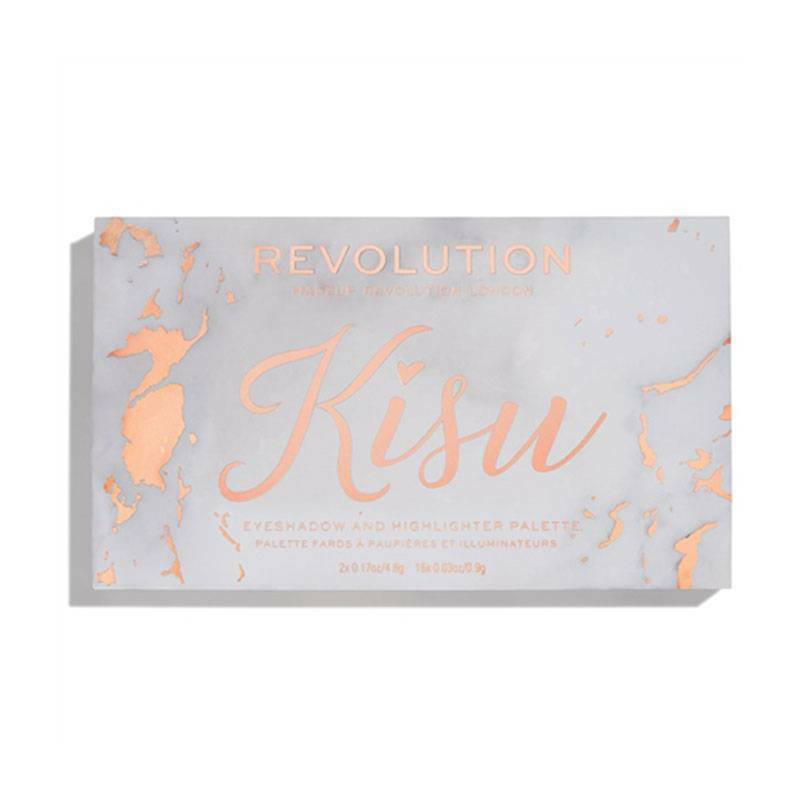 Het Makeup Revolution X Kisu Eyeshadow Palette is een prachtig palette met verschillende kleuren highlighters en oogschaduws. Het palette bevat 16 mega gepigmenteerde oogschaduws in uiteenlopende kleuren, met een matte en metallic finish. 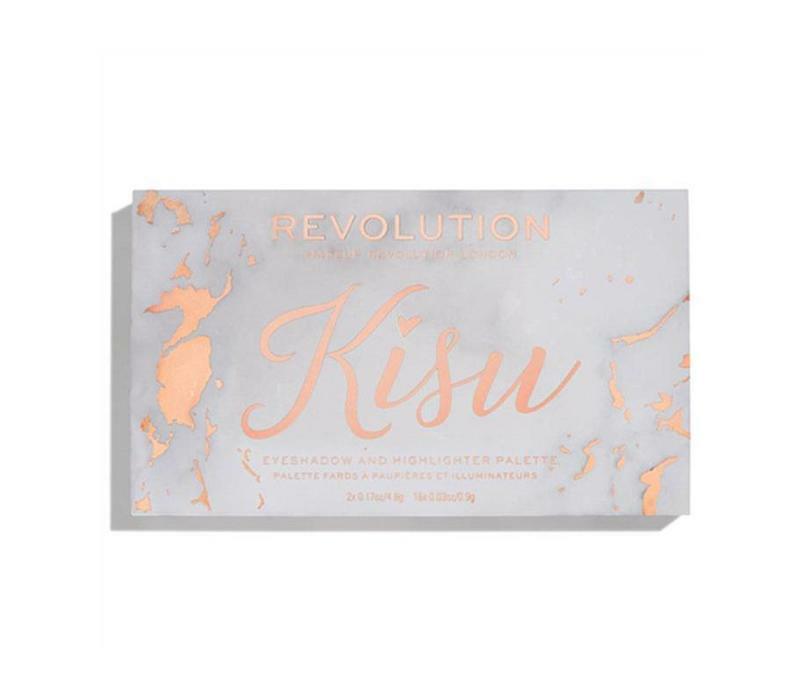 Daarnaast bevat het palette 2 prachtige highlighters in ijswit en een peachy roze met een gouden glitter. Beiden zijn makkelijk aan te brengen en te blenden. 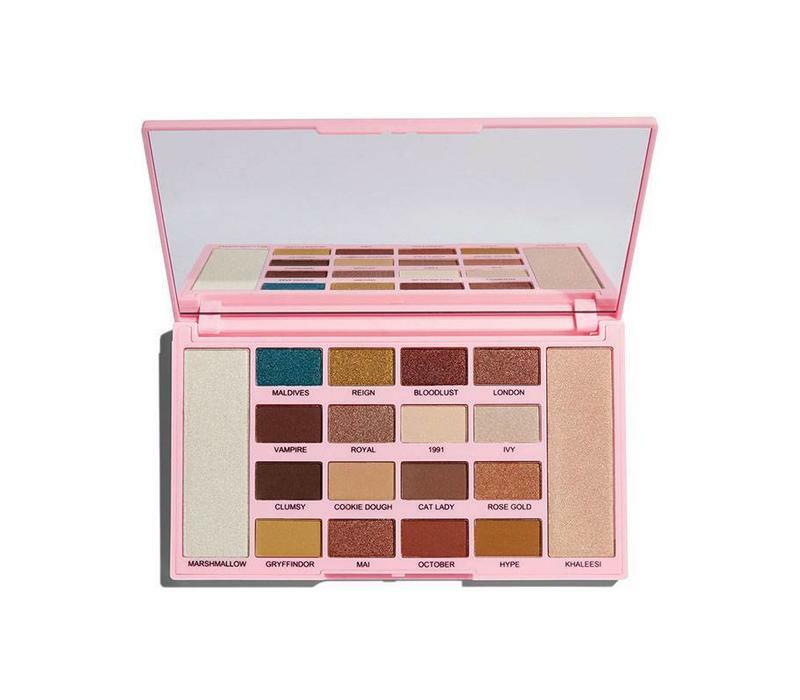 Met dit romantische palette kun jij eindeloos outstanding looks creëeren! Gebruik een oogschaduw kwast en breng de oogschaduw aan. Gebruik een oogschaduw kwast voor precisie en als je een hogere intensiteit wilt bereiken met de highlighter. 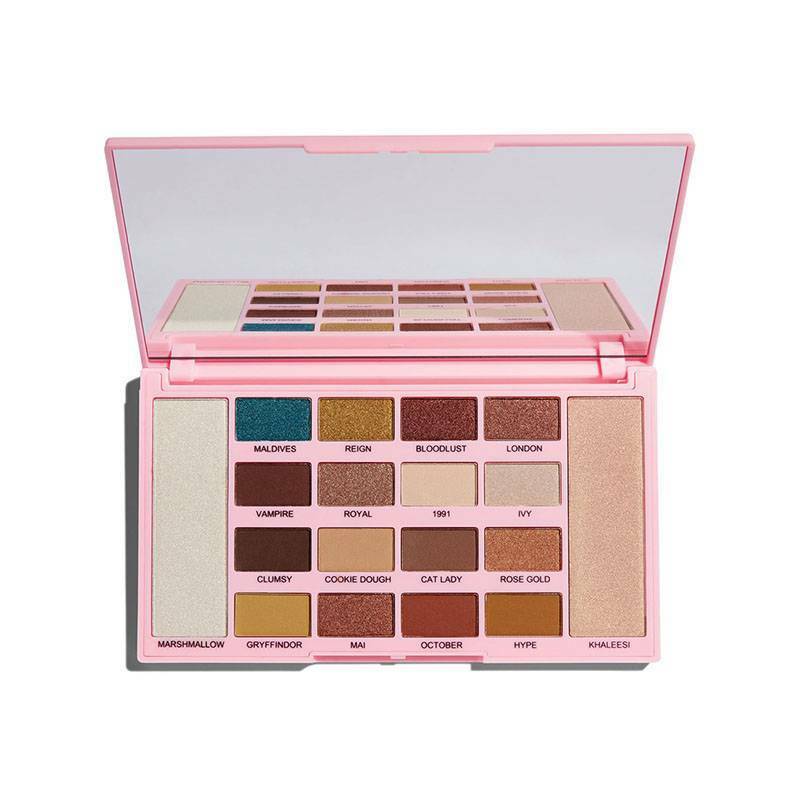 Eyeshadow: Shade 1: Mica, Talc, Paraffinum Liquidum, Ethylhexyl Palmitate, Magnesium Stearate, Polybutene, Polyethylene, Dimethicone, Tin Oxide, Methylparaben, Propylparaben, [+/-] Titanium Dioxide (Ci 77891), Red Iron Oxide (Ci 77491), Black Iron Oxide (Ci 77499). Shade 2: Mica, Talc, Magnesium Stearate, Ethylhexyl Palmitate, Paraffinum Liquidum, Dimethicone, Polyethylene, Polybutene, Methylparaben, Propylparaben, [+/-] Titanium Dioxide (Ci 77891), Red Iron Oxide (Ci 77491), Yellow Iron Oxide (Ci 77492), Black Iron Oxide (Ci 77499). Shade 3, 9, 10: Mica, Talc, Magnesium Stearate, Ethylhexyl Palmitate, Paraffinum Liquidum, Dimethicone, Polybutene, Methylparaben, Propylparaben, [+/-] Titanium Dioxide (Ci 77891), Red Iron Oxide (Ci 77491), Yellow Iron Oxide, (Ci 77492), Black Iron Oxide (Ci 77499), Ultramarines (Ci 77007), Fd&C Red No.40 (Ci 16035), Fd&C Yellow No.5 (Ci 19140). Shade 4, 6, 7, 8: Talc, Mica, Magnesium Stearate, Ethylhexyl Palmitate, Paraffinum Liquidum, Dimethicone, Polybutene, Methylparaben, Propylparaben, [+/-] Titanium Dioxide (Ci 77891), Red Iron Oxide (Ci 77491), Black Iron Oxide (Ci 77499), D&C Red No. 7 (Ci 15850), Fd&C Red No.40 (Ci 16035). Shade 5: Mica, Talc, Paraffinum Liquidum, Magnesium Stearate, Ethylhexyl Palmitate, Polybutene, Polyethylene, Dimethicone, Tin Oxide, Methylparaben, Propylparaben, [+/-] Titanium Dioxide (Ci 77891), Red Iron Oxide (Ci 77491), Black Iron Oxide (Ci 77499), Ultramarines (Ci 77007), D&C Red No. 7 (Ci 15850), Fd&C Red No.40 (Ci 16035). Shade 11: Aluminum Starch Octenylsuccinate, Mica, Talc, Paraffinum Liquidum, Magnesium Stearate, Dimethicone, Ethylhexyl Palmitate, Methylparaben, Propylparaben, [+/-] Red Iron Oxide (Ci 77491), Yellow Iron Oxide (Ci 77492), Black Iron Oxide (Ci 77499). Shade 12: Mica, Talc, Paraffinum Liquidum, Ethylhexyl Palmitate, Magnesium Stearate, Polybutene, Dimethicone, Methylparaben, Propylparaben, [+/-] Red Iron Oxide (Ci 77491) . Shade 13: Talc, Mica, Paraffinum Liquidum, Ethylhexyl Palmitate, Magnesium Stearate, Polybutene, Dimethicone, Methylparaben, Propylparaben, [+/-] Titanium Dioxide (Ci 77891), Red Iron Oxide (Ci 77491). Shade 14: Mica, Talc, Magnesium Stearate, Ethylhexyl Palmitate, Paraffinum Liquidum, Bis-Diglyceryl Polyacyladipate-1, Dimethicone, Polyethylene, Polybutene, Methylparaben, Propylparaben, [+/-] Titanium Dioxide (Ci 77891), Red Iron Oxide (Ci 77491), Black Iron Oxide (Ci 77499). Shade 15: Mica, Synthetic Fluorphlogopite, Talc, Magnesium Stearate, Ethylhexyl Palmitate, Paraffinum Liquidum, Bis-Diglyceryl Polyacyladipate-1, Dimethicone, Polyethylene Terephthalate, Polyethylene, Calcium Sodium Borosilicate, Polybutene, Tin Oxide, Methylparaben, Propylparaben, Silica, [+/-] Titanium Dioxide (Ci 77891), Red Iron Oxide (Ci 77491), Yellow Iron Oxide (Ci 77492), Black Iron Oxide (Ci 77499), Ferric Ferrocyanide (Ci 77510), Fd&C Blue No.1 (Ci 42090), Chromium Oxide Greens (Ci 77288). Shade 16: Mica, Magnesium Stearate, Talc, Ethylhexyl Palmitate, Paraffinum Liquidum, Bis-Diglyceryl Polyacyladipate-1, Dimethicone, Polyethylene, Polybutene, Methylparaben, Propylparaben, Tin Oxide, [+/-] Titanium Dioxide (Ci 77491), Red Iron Oxide (Ci 77491), Black Iron Oxide (Ci 77499). Highlighter: Shade 1, 2: Mica, Talc, Magnesium Stearate, Paraffinum Liquidum, Ethylhexyl Palmitate, Polyethylene, Polybutene, Silica, Dimethicone, Tin Oxide, Methylparaben, Propylparaben, [+/-] Titanium Dioxide (Ci 77891), Red Iron Oxide (Ci 77491), Carmine (Ci 75470). Inhoud : Highlighter 2 x 4,8 g. / Oogschaduw 16 x 0,9 g.